This post has been saved – unwritten – as a draft since I started this series of posts. The plan was to catch a train to Edge Hill one weekend, take a look around and some photos and write something interesting for the blog. Instead I find myself with just a dozen posts before reaching 125 and no time to spare to visit my Edge Hill Station in the way I’d originally planned. Instead yesterday evening while in the vicinity I did a “drive by” photo shoot. When I turned up the station was deserted – the ticket office closed and trains passing through without stopping on their way to Lime Street. For a station with such a history it’s a shame to see it so underused but there is perhaps still hope for it. Last year one of the station buildings dating from 1836 was converted into a space for use by Metal, an “artistic laboratory to champion the need for continual investment in artistic investigation and the development of innovative ideas”. Alas at 7pm on a Sunday evening it was closed, but at least that gives me a reason to get off at Edge Hill next time I’m passing through. If you feel I’ve not done Edge Hill station justice, you’re probably right. Go check out what Scott, “railway architecture fan” and former Edge Hill student had to say about it on his travels around every station on the Merseyrail map. This entry was posted in Edge Hill and tagged edge hill station, merseyrail, merseytart, railway, station by Mike Nolan. Bookmark the permalink. Ah, I remember Edge Hill station (and sidings) as a huge place, though not in the same league as Crewe Junction. There was plenty of steam and smoke, and lots of porters, drivers, footplatemen, signalmen and track workers. A platform ticket cost 2d (outrageously expensive when pocket money was about 1/- a week!) but allowed you to stay all day train spotting, ticking off the engine numbers in your train spotters’ book. And not just numbered engines, there were NAMED ones too, pulling trains between Liverpool and London, or Liverpool and Glasgow, Edinburgh and beyond. 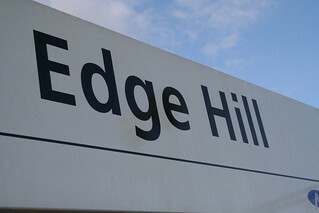 I was told that on one occasion a big cheese from the Dept for Education (or whatever it was called that week) had deigned to travel north to visit us, but couldn’t understand why there was no-one to greet him when he got off at Edge Hill station. I understood it was someone from Lancaster University down to deliver a session on supervising PhDs.